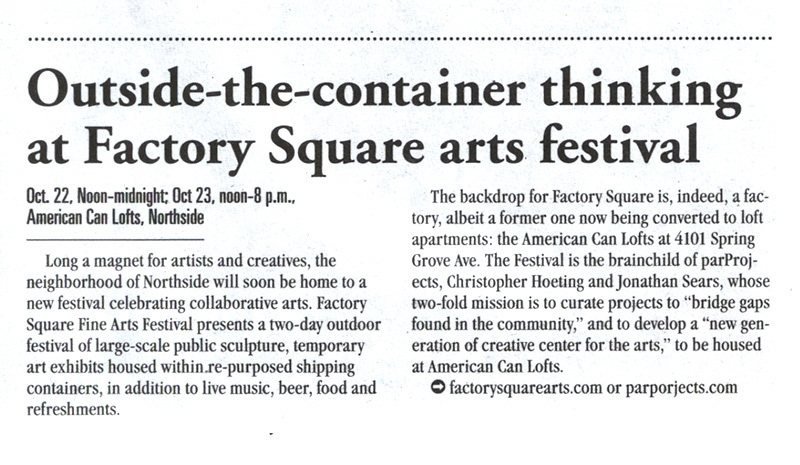 Sad that you missed The Factory Square Fine Arts Festival? Don't worry, we're doing it again! The graphic above says it all. We'll be back for Northside's Second Saturday celebration taking place November 12th, from 7pm - 11pm ...so don't hesitate to mark your calendar now. More details on some of the new specifics will be published soon. Thanks again for the coverage City Beat. Your staff is helping us really start to make a splash here in Cincinnati! The Factory Square Fine Arts Festival. Simple things like keeping an eye on specific container-galleries helps keep everyone (and the artwork) safe. At any rate, you're welcome. Click this sentence to help out. ...and please, don't forget about our Music Lineup. 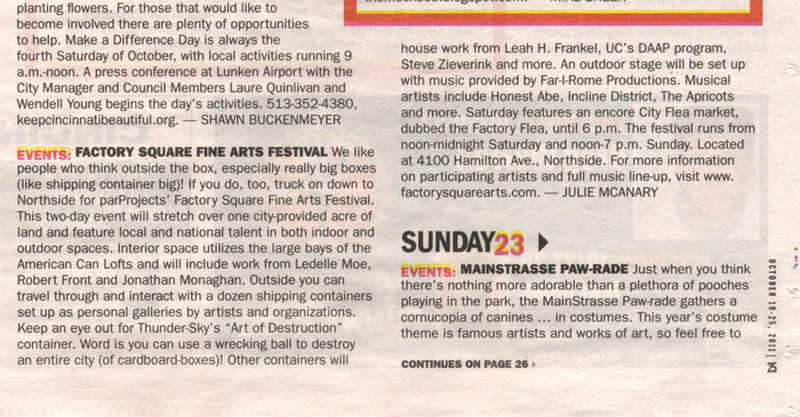 Above is an article by Express Cincinnati that highlighted The Factory Square Fine Arts Festival. We're grateful for the coverage and hope to continue providing exhibitions worth writing about. Click here to launch the mention in a new window. Once launched, clicking the article (again) will enlarge the text to a readable size. 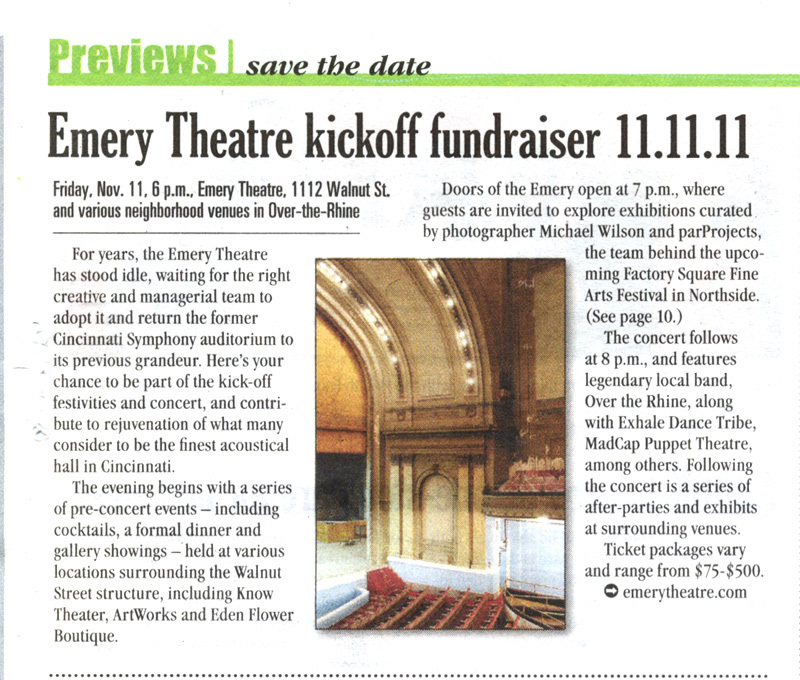 Express was also kind enough to mention The Emery Theatre's kickoff in the same issue. In the article above, you can briefly familiarize yourself with the Emery and their efforts to raise the historic theater back into the striving Over-The-Rhine district. We were happy to curate for The Requium Project (the group behind the theater's re-birth). Click here to open and enlarge this article in a new window.